Chadron State tied for ninth at the NCAA Indoor Championships in March and holds a cumulative team GPA of 3.12. 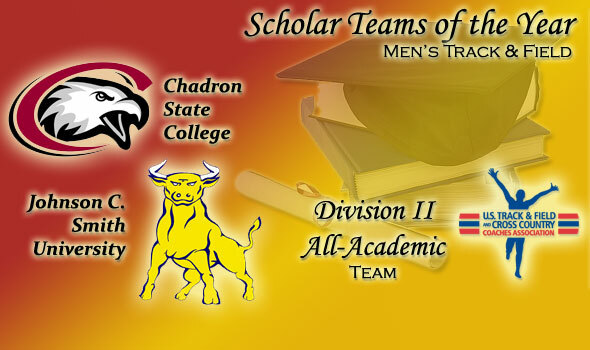 Karl McFarlane, Lanar Newman, Keegan Parr, Joe Schultz, and Brandon Segelke from Chadron State were among those last week that earned individual All-Academic honors. McFarlane placed third in the 60-meter hurdles at the national championships while Newman took fifth in the long jump. The Golden Bulls of Johnson C. Smith placed sixth at the NCAA Outdoor Championships in May and garner a cumulative team GPA of 3.13. Last week, Leford Green, the NCAA 400-meter champ, was named the Scholar Track Athlete of the Year for the outdoor season. Green, Winston Brown, Andrew Collins, and Akino Ming were named to the All-Academic team last week as well. Ming was the national runner-up to Green in the 400 meters and was won the 4×400-meter relay team with Green and Brown that won a national title. Truman State holds the best cumulative team GPA in the land among DII men’s track & field programs with a 3.48 tally. Bentley and Southwest Baptist follow in the category with a 3.39 and 3.30, respectively. The GLVC notched seven of its members to the All-Academic list while the RMAC, PSAC, and GNAC each had five squads represented among the nation’s best.